Assist offers a full contingent of creative solutions from brand development to website design through our strategic partner BWP Communications. Our designs include a wide variety of functionality, including shopping carts, product catalogs and onsite marketing tools, all designed to meet your business needs and make it easy for your customers to place orders and access information. Our philosophy regarding the ingredients for a successful printed piece involves the thoughtful incorporation of four key components. The design must be compelling, utilizing intelligent, creative type, color, imagery and space. Brand congruence needs to be strictly observed through the use of all appropriate elements of the brand architecture, as well as keen awareness of the market audience. It must have conceptual capacity. Design that incorporates and evokes thought as well as emotive appeal — even if only for a moment — is much more compelling and effective than visually uni-dimensional design. Our process includes company buy-in; internal and external research; development of branding models and platforms; validation of direction with customers, employees and stakeholders; design of all relevant collateral and materials and a 1- to 2-year implementation plan for communicating and supporting brands. A brand development project is as simple or complex as the product or client dictates, and each project is structured accordingly. We meet with you, have a meaningful discussion about your project, product or company, then work together to determine how we can best serve you. • Graphic Icon or mark (Component of full identity). • Typeface (Component or full identity). • Fully integrated brand identity (Audio/Visual trade dress of the brand). • Branding usage and style brief. • Type-style and font usage. 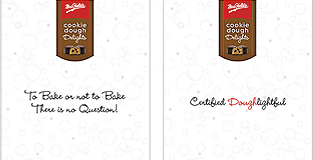 A series of print ads were designed for Mrs. Fields Cookies consistant with the brand integrity and brand persona. Mrs. Fields uses the complete Assist ERP Suite to run it's retail franchize business.